PhaseBio, a small biopharmaceuticals firm developing slow-release treatments for heart ailments at its offices in Malvern and San Diego, has captured investors’ imagination, nearly tripling in value since its initial public stock offering last fall. The stock accelerated Tuesday after PhaseBio said its brokers sold additional stock worth $49.5 million at $12 a share, up from $5 when the stock was first traded on Nasdaq last November. The company hopes to use most of that money, plus $61 million with which it started this year from the IPO and other fund-raising, to advance its development of drugs to treat heart conditions. Shares rose 9 percent Tuesday to close at $14.50, but lost 2.76 percent Wednesday to close at $14.10. That still gave PhaseBio a value of more than $300 million, a sign that investors expect big things from the company, which had no 2018 sales. It had burned through an average $2 million a month in expenses, and employed just 22 full-time (and two part-time) staff as of the start of 2019. In statements filed with the Securities and Exchange Commission, PhaseBio CEO Jonathan Mow (formerly at Amylin Pharmaceuticals and Bristol-Meyers Squibb) and other officials listed a pair of drugs under development. The company calls its lead candidate PB2452. It is designed to stop bleeding as a side effect of ticagrelor, a blood thinner with the brand name Brilinta for prospective heart-attack patients. It is made by AstraZeneca, whose U.S. headquarters are in Fairfax, Del. A second trial for the treatment is scheduled for this spring, after which the company plans to call on the FDA to speed final trials. Last fall, PhaseBio said it was starting a new trial for another drug candidate, PB1046, to treat pulmonary arterial hypertension (PAH). This treatment uses PhaseBio’s “half-life extension technology,” which uses recombinant elastin-like polypeptide polymers to slow release into a patient’s body, making a single weekly dose effective. 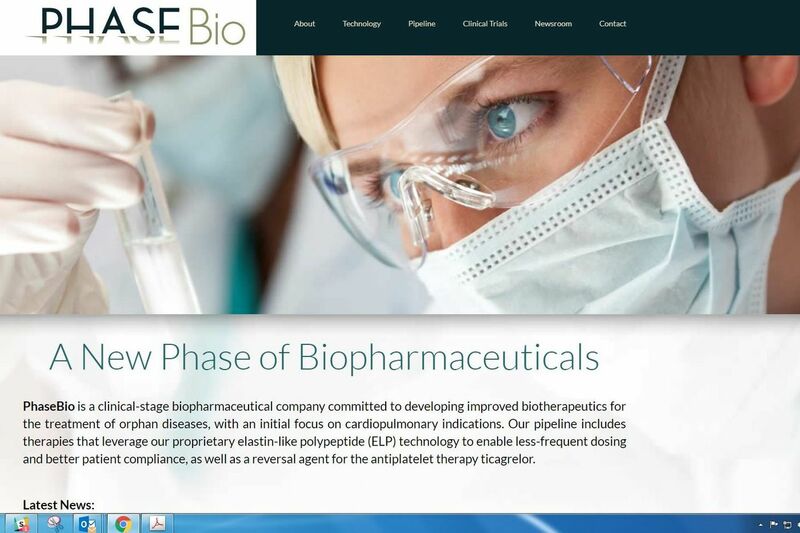 PhaseBio hopes to apply that tech to other treatments. In that double-blinded, parallel-group trial, 60 patients were to be evaluated for blood flow and exercise tolerance using the FDA’s six-minute walk test. At the time, chief medical officer John Lee said the drug had passed earlier trials with “generally safe” results. PAH is a rare disease, enabling the company to qualify for quicker approval and taxpayer aid not always available to treat more common conditions. That trial was supported by a taxpayer-funded Fast-Track Small Business Innovation Research grant from the National Heart, Lung, and Blood Institute of the National Institutes of Health.